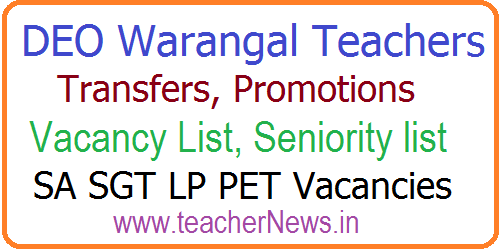 DEO Warangal District Teachers Transfers Vacancy List, Seniority list 2018 –Check SA SGT LP PET Vacancies: Warangal District Teachers Transfers 2018 Vacancy And Seniority List Download @deowarangal.net. DEO Warangal District Teachers Transfers Tentative Vacancy list Provisional Seniority list and Promotion Seniority list download at DEO official website. Warangal (Urban), Warangal (Rural), Mahabubabad, Bhupalpalli and Jangaon districts Teachers Subject wise, Post wise Provisional Vacancy List, Seniority list link here. Warangal District Teachers ZP/Govt. Sector Provisional Seniority list for Promotion link DEO Warangal ZP/Govt. Sector Teachers Provisional Seniority list for Promotion. SEO Warangal District Teachers Transfers, Promotions Seniority list of LP Hindi, LP Telugu, LP Urdu Vacancies list, SA – Telugu, Hindi, English, Maths, Physical Science, Biology, Social Subjects, SGT Vacancies and PET Vacancy list. District Educational Officer DEO Official Website web portal will keep all Teachers Transfers promotions Transfers Counselling Schedule related Information like SGT SA GHM PET Language Pandit Seniority List for Pomotions and Transfers. Teachers have to visit the official website of DEO Warangal District to get latest information about transfers and Promotions. Warangal District Teachers Transfers 2018 Vacancy list Seniority List @deowarangal.net. SGT, SA, LP, PET, HM Tentative Vacancy, Seniority list at Warangal DEO official website.